Lake Pueblo State Park is a state park located in Pueblo County, Colorado. It includes 60 miles (97 km) of shoreline and 10,000 acres (40 km2) of land. Activities it offers include two full-service marinas, recreational fishing, hiking, camping and swimming at a special swim beach. Lake Pueblo (also and more accurately known as Pueblo Reservoir) has a maximum depth of 135 feet (41 m) and is impounded by Pueblo Dam. 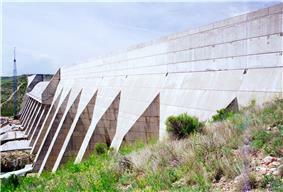 Pueblo Dam was constructed from 1970-1975 across the Arkansas River in Pueblo County as part of the Bureau of Reclamation's Fryingpan-Arkansas Project. While the primary purpose of the reservoir is to provide supplemental water for agricultural, municipal, and industrial uses, water from Pueblo also helps enhance recreation, fish and wildlife. Additionally, and unlike most reservoirs Reclamation constructed in Colorado, Pueblo Dam provides for flood control because the Arkansas River has a history of flooding roughly every ten years, the most notable of which was in 1922. In addition to the reservoir, the Park also encompasses the Lake Pueblo Fish Hatchery and Rock Canyon Swim Beach, located just downstream of Pueblo Dam along the shoreline of the Arkansas River. Today, Lake Pueblo serves as the Fry-Ark's primary storage vessel for the lower Arkansas Valley. The Lake is able to store a total of 357,678 acre feet (441,189,000 m3) of water when at full capacity. Levels in 2009 were reported as a total of 234,347 in active acre-feet storage of water. The land surrounding the reservoir is very diverse. Mammals commonly sited or observed at the park include mule deer, coyote, cottontail rabbit, red fox, gray fox, beaver, raccoon, skunk, prairie dogs, and badger. It also plays home to many different reptile species bull snakes, rattlesnakes, sagebrush lizards, coach whips, and box turtles. It is notable in that it also home to a rare species of serpent, the blackneck garter snake. ^ "Lake Pueblo State Park". Colorado State Parks. Retrieved 2009-09-19. ^ "Lake Pueblo State Park, Colorado". Mountain Wayfarer. Retrieved 2009-05-19. ^ "History of Lake Pueblo". Colorado State Parks. Retrieved 2010-10-15. ^ "Fryingpan-Arkansas Project". Fryingpan-Arkansas Project-Colorado. Retrieved 2009-05-19. ^ "Wildlife at Lake Pueblo". Colorado Dept. of Natural Resources. Retrieved 2009-05-20.